The best present you can give the NHS this Christmas is to agree to share your health record. It’s a present that doesn’t cost a penny and could also save your life. Many people do not realise that in an emergency medical situation the person treating them will only have access to their basic health information. By completing a simple form and handing it in to your GP practice, you can agree to share your health record – meaning every health professional called upon to treat you will be able to access useful information about your health. More and more people are recognising the potential life-saving benefits of sharing. Almost 100,000 people have signed up to record sharing since the beginning of the year. Current figures reveal that 271,000 people in east and west Suffolk have agreed to share their health record, compared to 175,000 at the start of 2018. Dr John Oates, a GP in Saxmundham and a member of the Governing Body of NHS Ipswich and East Suffolk Clinical Commissioning Group, said: “Agreeing to share your health record is one of the best ways of ensuring that you receive effective and speedy treatment in an emergency. “Most people have a summary care record which contains very basic health information which is created from your GP record. In an emergency, such as seeing an out-of-hours doctor or if you are taken to A&E, the health professional treating you will only have access to that basic information. “You also have the option of agreeing to share your full medical record, which enables the health professionals treating you to know more about your health and medical history so they can deliver the most effective and speedy treatment. 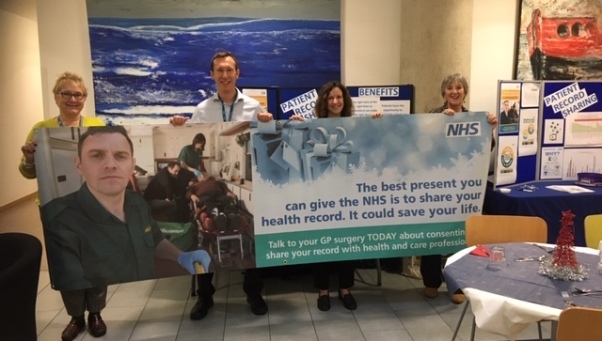 Below is an image featuring staff from NHS Ipswich and East Suffolk and NHS West Suffolk CCGs – Carol King, Oliver Riches, Cara Twich and Maggie Aldridge – at a health record sharing awareness event held at West Suffolk House in Bury St Edmunds earlier today. The banner will also be on display outside Ipswich Hospital over the next few weeks.